The saddleback caterpillar (Acharia stimulea) is a sluglike caterpillar that has a bright brown spot in the middle of a green saddle-shaped area on its back. 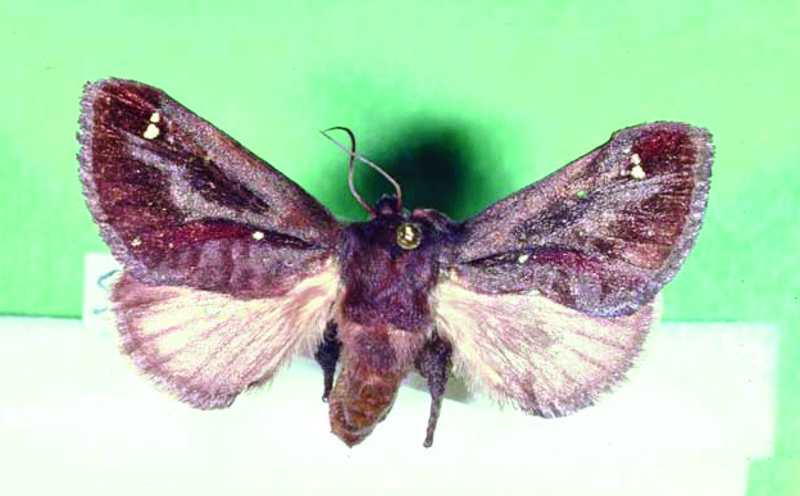 It has four prominent horns on each end of the body that hold potent hemolytic venom. The caterpillars can grow up to 1 inch (2.54 cm) when mature. Saddlebacks are solitary feeders and can be found on a variety of foliage, including apple, basswood, cherry, chestnut, dogwood, elm, maple, oak, plum and even corn. The saddleback caterpillar is found across the eastern United States, ranging from Florida to New York, and as far westward as Texas, Indiana and Kansas. Saddlebacks are venomous and are among the most common stinging caterpillars in North America. The saddleback sting is immediately painful, with radiation from the site of the sting to the local lymphatic group. Without blistering, symptoms usually subside within two to eight hours. Symptoms, including migraines, gastrointestinal issues and asthma, can last for five hours. A sting may leave red blotches on the site. Allergies to these stings have been documented, and stings should be watched for any potential anaphylactic reaction. To relieve pain, antihistamines should be taken and a cold compress applied. Remove urticating hairs and spines using adhesive tape. Wash the stung area with soap and water or a sterilizing agent and allow to air dry. These solutions should be then be allowed to dry thoroughly. Anaphylactic reactions are rare. If you suspect an allergic reaction, or if stung regions are significantly swollen, see a doctor for medical attention. Saddleback caterpillars have two generations a year. Adults emerge in March, with the first generation of caterpillars appearing between April and July. The second generation appears between the end of June, with caterpillars emerging from August until October. They then pupate through the winter, emerging the following March. 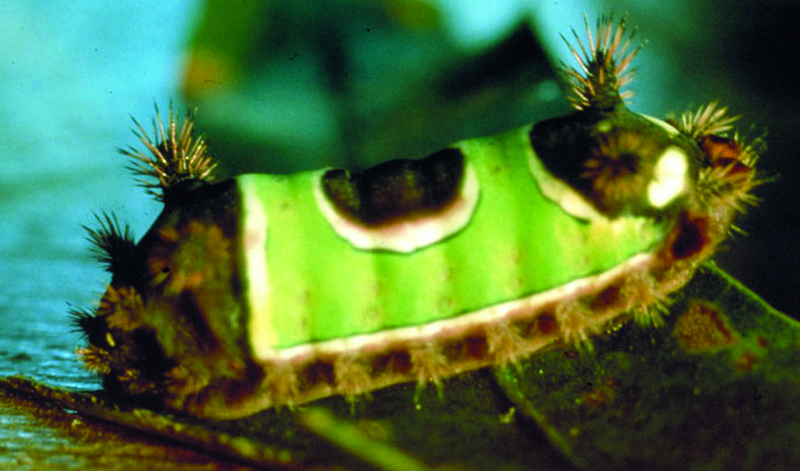 Caterpillars can cause some minor damage to host plants, but major infestations are rare. If major infestation is present, chemical control is available. Contact the LSU AgCenter and your parish agent for information on chemical control.